Another night was going to pass by with me thinking our evening meal was yet again not yummy enough to blog. 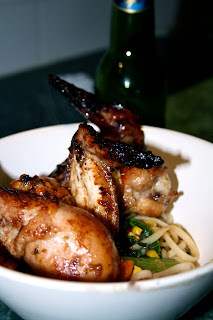 Maybe that is the wrong thing to say because I knew it was going to be yummy......perhaps I should say, I thought chicken wings weren't glamorous enough to blog? Glamorous or not, chicken wings would have to be one of my (and my families) favourite bone cracking, skin sucking sweet meats we love to eat. It doesn't matter what you put on them, they always seem to be finger lickin' good. A good grilling is how I prefer my wings. Sure you can pop them in the oven, however, you don't get those cindering looking wing tips that I love to crunch on. Nor do you get the blistering skin when you roast them in the oven. Nope, the less fuss the better and that is why I quickly marinated our wings while the tile guy was hear finally fixing our bathroom floor and just before racing out to swim lessons. A good hour marinated is something we should all have in the back or our minds and why should I spoil the simplicity of this meal with extravagant side dishes? Why indeed! this is why I always have a packet of dried udon noodles in the cupboard so I can whip up a quick veggie and noodle stir fry giving the wings a lovely colourful bed to sit on. I knew we were a lot alike. They are just the kind of glamorous dinner my family loves. 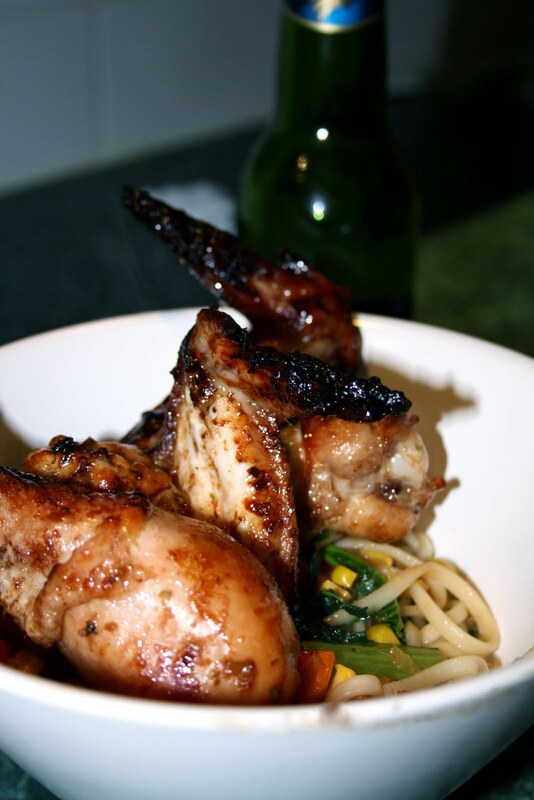 I seriously love chicken wings done on the grill, there is just no better way to do them. Like you said the charred tips and the crispy skin just can't be beat.